As Coral Gables Restaurant Week drew to a close, I realized I just had to try one more of their participating restaurants while there was still time. Having just returned to the 305 from a seven day cruise aboard Royal Caribbean's Allure of the Seas (where I ate over five times a day), and after uncovering the conspiracy my bathroom scale was plotting against me, I decided to go somewhere that featured a lighter approach to dining. 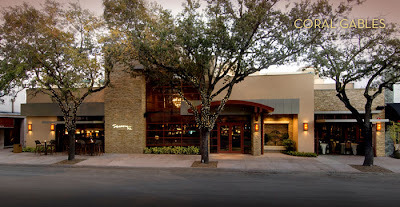 I met up with a friend and fellow blogger, and after checking out the list of restaurants and their menu offerings, we opted to go for Seasons 52, located at 321 Miracle Mile in Coral Gables. Seasons 52 is part of the national Darden family of restaurants which include popular brand names such as Red Lobster, Olive Garden, The Capital Grille, and Bahama Breeze, among others. There are currently 21 Seasons 52 restaurants open nationwide, with plans to launch another nine between the Fall of 2012 and Spring of 2014. It is a very unique restaurant; delivering a concept that unites value, good taste and healthy, lower-calorie options in a casual, sophisticated atmosphere. The moment we sat down and our waitress came to greet us, she asked if we had dined there before. 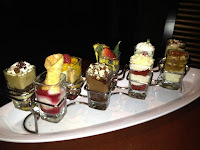 While my friend had, I explained that I hadn't, so she went on to tell us quite a bit about the origin of the name Seasons 52; as well as of their menu. It turns out the name epitomizes their concept: Seasons because they change their menu seasonally; offering sensational flavors inspired by the four seasons. 52 because their Specials Menu, found on the side panel of their menu, changes weekly, 52 times a year, in tune with providing the freshest products and ingredients available. This concept allows patrons the opportunity to taste fresh infusions of flavors and dishes, at their ingredients' peak of freshness and flavor profile. The best part? All of their dishes are under 475 calories, so you can indulge without the guilt! Seasons 52 uses natural cooking techniques, including wood-fire grilling and caramelizing vegetables, to allow the natural flavors of the ingredients to shine, without the unnecessary calories. Take that...bathroom scale! On to the food and drinks! It was Friday, the end of a stressful week, ya de ya de ya de...so I ordered a Hawaiian Pineapple Cosmopolitan. It was made with Van Gogh Pineapple Vodka and Patron Citronge. I loved it! It was just what I needed! I was also happy to learn they have a great international wine list, featuring over 50 wines by the glass. Since I wanted to try their fixed price Restaurant Week menu, I started off with the recommendation of both my friend and the waitress: the Ripe Plum Tomato Flatbread. This is one of their most popular dishes and there is no wonder why. It is amazing! A thin, crunchy flatbread covered with plum tomatoes, fresh basil, roasted garlic and melted Parmesan cheese, sat atop a large cutting board; just waiting for me to dig in. It was extremely light, fresh and tasty. For the second course, I had the Baby Spinach Salad. Very nice! It consisted of a bed of fresh, organic baby spinach, topped with raspberries, toasted pine nuts, and crumbled gorgonzola cheese; all drizzled with a white balsamic vinaigrette dressing. I found it truly refreshing and enjoyed the sweet and salty combination of the raspberries with the gorgonzola cheese. As I looked through the choices for the main course, I was caught between two: the Caramelized Sea Scallops and the Char Crust Filet Mignon; both known to be crowd favorites. After some thought, I decided on the Filet Mignon. It was served over Yukon Gold garlic mashed potatoes, and accompanied with fresh carrots, asparagus and roasted mushrooms. There was also a sweet tamarind dipping sauce I couldn't get enough of. The filet was crispy on the outside, and juicy and tender on the inside; with a bold, smoky taste. It was a very generous and filling portion; hard to believe no more than 475 calories! Finally, comes the second reason I wanted to have an adventure at Seasons 52 (although totally conflicting with the first). When I got a taste of their desserts at the Taste of the Gables event I attended (See my post for Taste of the Gables for the scoop), I knew I needed to try more. They are the pioneers and originators of the award winning Mini Indulgences: individual servings of classic desserts we all love and enjoy, served in shot-size glasses. I'm sure you've seen these offered at other restaurants, but I learned they actually started here. There are a variety of flavors to choose from: Mocha Macchiato, Belgian Chocolate Rocky Road, Key Lime Pie and Raspberry-Mango Cheesecake, to name a few, and trust me when I tell you that all the ones I tried at the Taste of the Gables were delicious. Additionally, they offer seasonal flavors as well, like Pumpkin Pie Mini and Strawberry Shortcake, which also sound like music to my ears. Tonight, I had the Mocha Macchiato and it blew my mind. I felt like I was getting a rich, decadent dessert and a shot of coffee all at the same time. The only thing I regret is not having two or three more since they were so good. But, I have to remain vigilant! Like I told you before, it's on between me and the scale. As I was finishing up my visit, I found out that Seasons 52 offers a bunch of alternative menus to satisfy every dietary need and palate. Their choices include: vegan, vegetarian, lactose-free, gluten-free, low-sodium and garlic-free. Wow! I don't know a single reason not to try try this place! For more information or to make reservations, you can contact them at 305-442-8552 or visit them online at https://www.seasons52.com/.